How do you like your bananas? I’m a pretty firm believer in eating them when they’re completely yellow, I’ll even take a hint of green. Once the spots start they’re overripe and I wait until they’re good and splotchy and use them for baking. Lately it seems like my bananas are ripening faster than ever, and I ended up with 6 baking-worthy bananas that I needed to deal with before the fruit flies got to them. So naturally, I experimented with them. I’d seen mention of caramelized banana muffins, which sounds awesome. But I didn’t want an overly sweet dessert muffin, so I continued to do a bit of searching and found several recipes that recommend roasting. So with 6 bananas, I tried both. 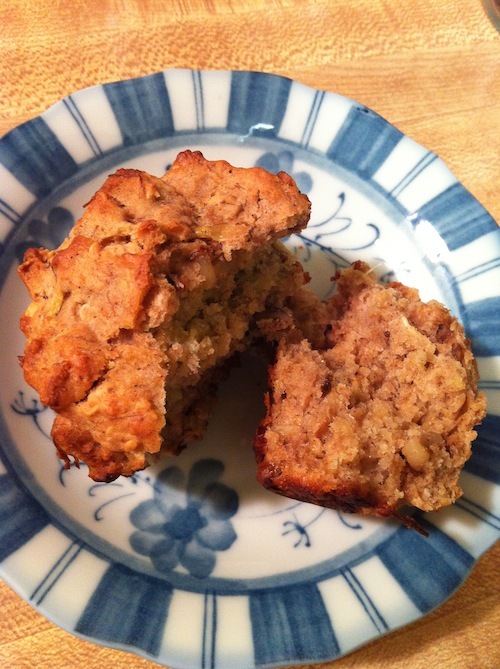 For this recipe I ended up liking the roasted ones just a bit better (although warning: scooping banana out of roasted banana peel is super unappetizing), the banana flavor permeates the whole muffin, adding just a little extra sweetness. Caramelized was also good, but there were just bits of banana flavor in the muffin, it wasn’t suffused with the flavor. If you want to try caramelized, just melt 1/2 stick butter in a large skillet, add the brown sugar and slices of banana and cook for a minute or two. Otherwise, below is the recipe for just sweet enough, roasted banana muffins that are perfect for breakfast with a cup of coffee. Preheat oven to 400°F. Place bananas on a foil lined baking sheet and bake for about 15-20 minutes, or until black and fragrant. Remove from oven and allow to cool. Meanwhile, in a medium bowl, combine dry ingredients (oats through sugar) and mix well. In a large bowl, mix together wet ingredients. Add dry ingredients to the wet and mix until just incorporated. Divide batter into greased muffin tins and bake for about 18-22 minutes, or until a toothpick inserted into the center comes out clean. Allow to cool in tins for about 5 minutes, then remove to a wire rack and allow to cool completely. This have a lot of moisture in them, so to keep them fresh, store in the refrigerator in an air-tight container for up to a week.